I am a firm believer in everyone having a month at a glance calendar and weekly calendar. A daily page is fine, but it really only functions like a list and can often cause us to micro-manage time, losing site of the big picture and where our time is going. A monthly calendar lets us keep track of the BIG items, the major appointments, the birthdays, holidays and other special occasions. The weekly calendar lets us look at our week from a broad perspective. I believe we can either think about 24 hours per day, or we can think about 168 hours per week. When we allow ourselves to focus on 24 hours per day, we confine our time. There is no way in a 24 hour period to do something in each of your priority areas. Planning day to day means we have to be extremely disciplined each day to think about ALL of our priority areas and deliberately decide which one is most important for the day. I have never been disciplined to do that. When I confine my thinking to 24 hours I find I fail to do any task in some of my priority areas. I also find that carrying over tasks from one day to the next grows, sort of the snowball effect, the farther into the week I get. Planning day to day also makes it more difficult for me to say “yes” or “no” to requests that come up. Allowing myself to focus on 24 hours limits my awareness of what’s next and not being fully aware of that often means I respond in the wrong way to requests. 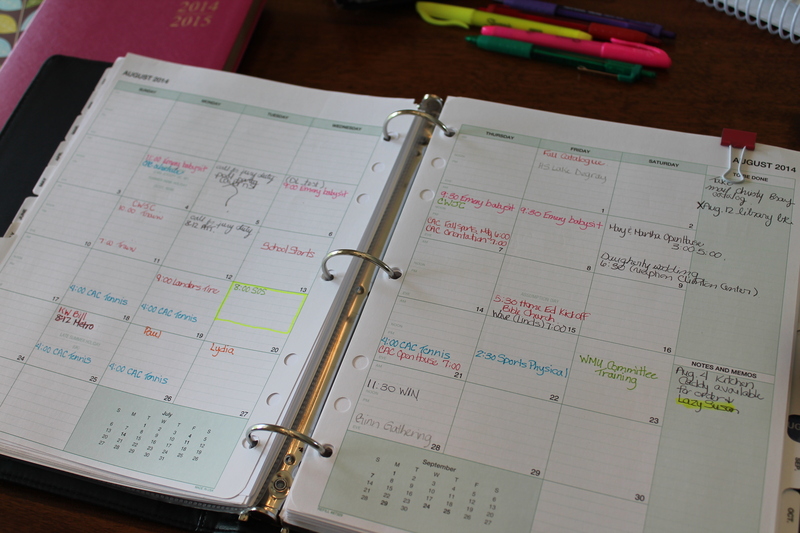 Weekly planning gives me a broader picture of my life. It also affords me the opportunity to map out activities in each of my priority areas. I also find that with weekly planning I can be more flexible. I can move tasks around depending on unexpected interruptions/opportunities and feel comfortable doing so because I know I have mapped out my priority areas for the week. 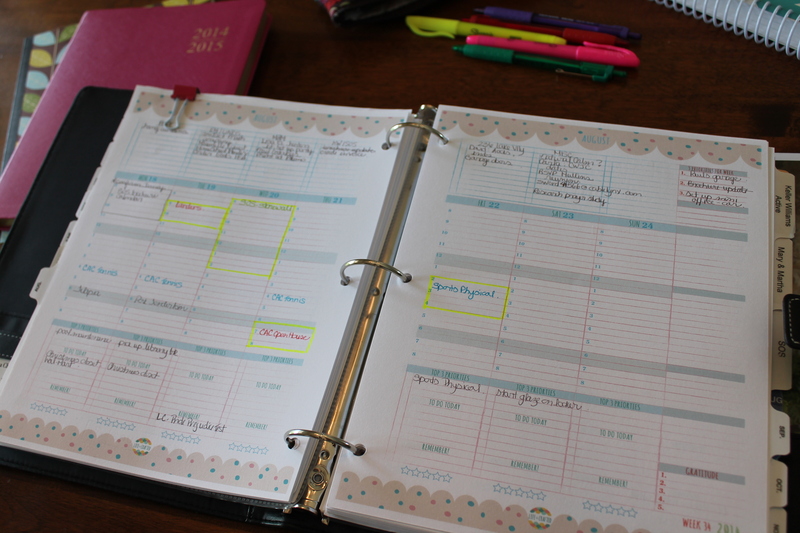 Weekly planning makes me more aware of time-realizing how much I actually have. Laura Vanderkam in her book, “168 Hours: You Have More Time Than You Think”, speaks to this point. Through her research she found that time and time again people over-estimate the amount of time they work. It is doubtful that anyone in this country really works more than 60 hours per week. People think they do, but only because they really have no concept of time and how they are spending it. When I focus on 24 hours, I find myself in this very position. Feeling overwhelmed and rushed. Successful weekly planning begins first with knowing what “Must Do” appointments exist for the month. Block those items off in your calendar using a red pen. Doctor’s appointments, parent-teacher meetings, kids’ events, staff meeting, etc.. Estimate how much time each appointment will take and block that amount of time off. To help me balance where I spend my time, I like to keep a running list of the tasks I would like to or need to complete that week for each of my priority areas. I love the Planner Pad and the space it offers for this (see above). I jot down tasks for home, my business, my blog, board appointments, the kids etc… I generally have about 6 areas. Once I have those lists, I either block off specific times on the calendar (a client appointment, blog deadline…) or block off periods of time I know I will be less distracted and able to tackle a few projects. Each priority area has a color. If there is a task I really need to complete in order not to fall behind, I highlight it in yellow. Each week I am surprised by how much “white space” I have left. And that is important. We all need white space. That’s a whole other post, but white space affords us time to breathe, deal with the unexpected or experience the joys of the spontaneous. 168 hours is a lot of time. When I sit down and look at my time from that perspective, looking at the week as a whole, I can always find time to block off for the important, the necessary. By color coding I can visually see if one priority area is getting more of my time than another, and determine whether or not that is warranted. Weekly planning frees my mind. Instead of watching the 24 hours tick away, I find myself enjoying each day and looking forward to the hours yet ahead. If you have felt overly stressed by your schedule, seem to never get everything done, find yourself spending more time making lists than doing tasks, I challenge you to try weekly planning. PlannerPadCopycat This coming Friday set aside an hour. Pull out your phone, calendar, slips of paper lists… and think about how you want to invest next week. Block off your time. Know there will be interruptions and opportunities. Leave yourself some space for those. Then, enjoy your weekend knowing you are prepared with a weekly plan of action come Monday morning.